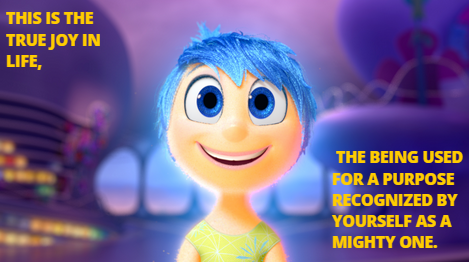 Image is a still from a great movie, Inside Out, and the quote is from a Harvard Business Review article "From Purpose to Impact." After some time to think it became clear that some changes to the structure and purpose of the site were needed. I was simply writing about what caught my eye and while this gave me a wide lens, it also made it that more intimidating to put my thoughts out there. That mindset is gone now! This particular page is going to try to synthesize all of the great pieces on imagination, creativity and innovation in particular. There's so much good stuff out there about these topics it's hard to tell if everyone is just saying the same thing in a different way or if there are some fundamental differences. Here's some of the works I intend to write about. This list will change over time, but here are the works that started it all for me. One could say that I'm a fan of innovation. Every one of these pieces has resonated with me in one way or another, but it was the Innovation Sandbox that really got the juices flowing. Anyone can innovate, but not everyone. Innovation is not a destination, but a mindset and a journey. It often goes hand in hand with entrepreneurship. The article was full of little nuggets, but my main takeaway was that constraints do not prevent or limit innovation. Rather, it can spark creativity and lead to challenging long established assumptions within an industry, both key components that lead to breakthrough innovations whether you’re trying to change lives or not. It inspired this graphic I made on Canva. I call it corporate glaucoma. Essentially, this is a mash up of the Innovator's Dilemma and Lynn Stout's The Shareholder Value Myth (or 'the dumbest idea in the world" - Jack Welch). In the US constraints often inhibit innovation, particularly within well established companies. Many of the constraints are internal such as ROI, profitability and other metrics that essentially turn any vision the company started with into tunnel vision. They can artificially inflate the risk associated with an idea or opportunity and most large organizations today do all they can to avoid risk or maintain the status quo. As the graphic above indicates new ventures and startups begin with an audacious vision insulated by the organization’s ability to innovate and adapt. As the startup finds success and validates its business model, it begins to transition from searching for questions or answers to becoming more efficient at executing its strategy and tactics to scale up. Often an IPO becomes a goal to either aid the scaling up process or deliver a return to investors. Now there are more cooks in the kitchen and the vision really starts to fade. Finally, the ultimate goal becomes satisfying shareholders. The vision at this point is hanging on by a thread at best and abandoned in practice at worst. 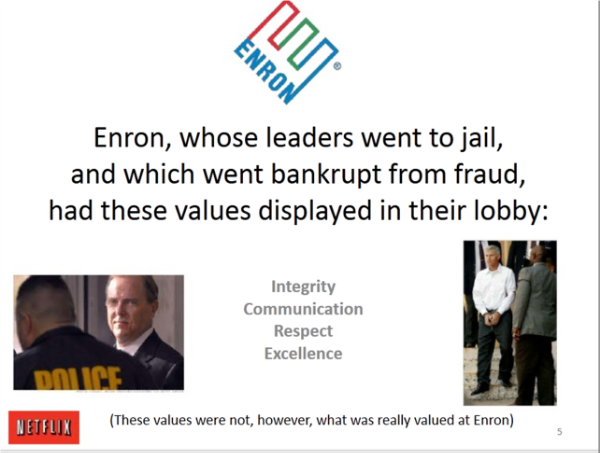 This is how something like Enron can happen. Where your company history and what you say is a little different than what you do. From Netflix's culture presentation. Find it here on slideshare. Definitely worth a look for other reasons. I think that's enough for what was supposed to be an introduction. Next time you think something is hard give the Innovation Sandbox a read. You've scrolled this far, punish or reward your fingers by subscribing to Andrew's irregular blog. What's irregular about it? Frequency, content, consistency, the author...shall I go on? Sign up with your name & email address to receive news and updates from Andrew's blog. We respect your privacy. Your contact info will only be used to send updates from Andrew's blog. Many thanks! If you have any suggestions, particularly regarding the frequency of the newsletter, or would like to post as a guest blogger, I am all ears.